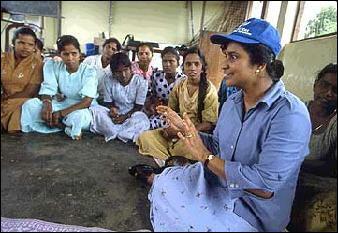 According to the UNHCR, Miss Arulsubramaniam's work has focused on empowering residents of welfare centres by promoting awareness of their rights. Miss. Arulsubramaniam has been instrumental in supporting welfare centre residents in the Trincomalee District to establish elected committees representing the community, voice their concerns and initiate various programs for their benefit. A continuing theme in her work throughout this time has been the need for greater participation of women in the decision-making processes in welfare centers. She is also working to address the problems of sexual and gender-based violence among displaced communities. Mr. Lubbers gave 20 awards to refugees, non-governmental organisations (NGOs) and UNHCR staff for their work in building the capacities of refugee women and promoting gender equality, but cautioned that despite the progress made so far, there was still need for more work. "Together we have been pushing this rock, and it has moved quite a lot but it is not at the top yet," he said in a symbolic reference to the collective effort being made by UNHCR, its partners and refugees to bring about gender equality, according to a news release from the UNCHR. Presiding over the ceremony at the Geneva headquarters of UNHCR, Lubbers recognised the efforts of six NGOs working with refugees or internally displaced people, five refugee groups/individuals, eight UNHCR staff and the entire UNHCR Ghana office team. "We should give public recognition for their work. It is stimulating for them and for others," Lubbers said in remarks at Friday's ceremony, the second since the inception of the award scheme in 2002. The UNHCR chief noted that one of the obstacles in the joint effort to build the skills and capacities of refugee women was violence against them, which he said prevented refugee women from living full lives in safety and security. "Violence undermines women's personal, social and economic advancement and prevents us from supporting their choices and capacities for durable solutions," said the High Commissioner, who also called for more action to combat violence against women. "We must act – act to inform, act to support, act to empower and act to remove all the barriers which make women vulnerable to violence." The award-giving ceremony coincides with a world-wide campaign dubbed "16 days of activism to end violence against women", which is held every year from November 25 – December 10 to step up efforts against gender violence. The winners of this year's UNHCR awards were drawn from Africa, North America, Asia, Europe and the Middle East. On hand to receive the certificates of recognition were Linda Awanis, an Iraqi refugee and President of the Council of Refugee Women in Bulgaria; and Dzana Popovic, a former refugee from Sarajevo and social worker with the Organisation for Aid to Refugees which is based in the Czech capital, Prague. Two UNHCR staff members – Aruni Arulsubramaniam, Senior Communities Assistant from the agency's office in Sri Lanka and Nemia Temporal, based in Geneva, were also present. Another recipient of the award – Mary Diaz, the head of the US-based Women's Commission for Refugee Women and Children – expressed her appreciation in a pre-taped video address. The number of award recipients has doubled from 10 last year to 20 this year to reflect the growing efforts by a wide variety of actors to educate refugee women about their rights, build their skills and ensure better representation and involvement of refugee women in key activities. 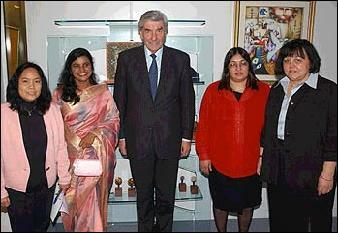 Ms. Arulsubramaniam is the grand daughter of Late Mr and Mrs Paranjothipillai Rajaledchumi and the daughter of Mr and Mrs Arulsubramaniam Thayanithy from Trincomalee, Sri Lanka. She is an old student of Trincomalee St Mary’s College and has a Bachelor's Degree in Business Administration from the Eastern University, Batticaloa, with an Honours Degree that focused on leadership among school principals in the Trincomalee region. She is continuing to investigate the issue of leadership as she completes her MBA at the University of Colombo. The UNHCR headquarters in Colombo in their report mentioned that “prior to joining UNHCR, she had worked as a volunteer with the Sri Lanka Red Cross. A central part of her work there was to improve disaster preparedness among Internal Displaced Persons living in welfare centres, establishing women’s and men’s working groups that could come together to prepare a disaster preparedness work plan. Although she works with UNHCR, she remains a SLRCS volunteer. In her work with displaced communities, she consistently demonstrates tremendous initiative and seemingly boundless energy. For a relatively young women, she displays great maturity in her dealings on sensitive issues. She is people oriented and inclusive, a skilled communicator with an ability and a genuine desire to seek the opinions of all members in a group, be it her fellow staff members or residents in a welfare centre. In acknowledging the award at the Geneva ceremony Miss Arulsubramaniam expressed her sincere thanks for the award in recognition of the dedicated teamwork, and the true sprit of collective hard work with the colleagues in Trincomalee, and of all UNHCR’s international and national staff based in Srilanka. At the end of her speech she expressed her sincere thanks to Mr. Neill Wright, Wallaya Pura, Jim Worrall, Brita Helleland, John Breusch, Simon Andrewartha, Nienke Kramer and other colleagues of UNHCR for their able guidance in her career and endeavours.